Communist means anti-racist. Freedom of speech means racist. What?!? Massive media bias, distortion. Communist means anti-racist. Freedom of speech means racist. What?!? Lots of mainstream media lies. Communist means anti-racist. Freedom of speech means racist. Massive media bias. Media distortion. How long have these mainstream media lies been happening? A few days ago I wrote about a rally I went to. For my eye witness report, with lots of photos, click here: Communists against Pegida. 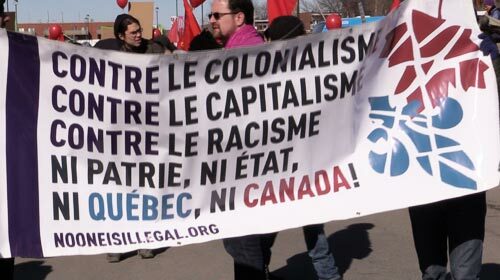 The mainstream media omitted any reference to Communists (despite the many hammer and sickle signs, despite the huge slogans against capitalism and against colonialism) and referred to them as anti-racists. Of course they also ignored that Pegida is not concerned with race, but against an ideology, Islam, that prohibits many freedoms, like freedom of speech. When I was in service, the usual demonstrators were very similar. Back then the 'anti-war' and 'nuclear disarmament' groups were all promoted and penetrated by the various communist flavors ('socialist', communist (marxist-leninist), 'trotskyist', union left, etc), all more or less at war, ideologically, with each other, as were all the unions with the union positions of power (general secretary, etc). All were communists or affiliates. This all came out of the old 'Communist International', promoted and funded initially by Moscow and eventually copied by Peking. After Hungary, and after Czechoslovakia under Dubczek, local support split and fragmented here in Australia; probably something similar happened in Canada. But the main point is the involvement of the unions and their officials. Things have moved on; the old guard has died and a new crew has taken over who still have ideological allegiance to the old Soviet system, but why they are aligning themselves with the islamists is strange, unless it's just a convenient source of protest troops for their marches/demos, as islam is a theocracy and does not necessarily follow the tenets of Lenin; islam would override communism in a flash to impose its version of oppression. But they seem to be in bed together. Adbusters magazine—the flagship of the Canadian non-profit Adbusters Media Foundation that spawned Occupy Wall Street (OWS)—is out to take down Stephen Harper’s Conservative Government in October elections. The magazine . . . calls all restless millennials to arms in a revival of 1960-styled protests for ultimate Marxist takeover. A question: who was paying the piper in the 60s and 70s, and who is paying the piper now? The unions? Islamic groups? A mixture? Of course, fueling the groups, beyond money, are socially encouraged rage and self-righteousness. Which brings us to the question: who is fueling that? A further sign of media bias: the media hides reality with words like "the groups clashed" - instead of reporting who struck whom. At the rally I went to, there was a massive police presence, including riot police. The concern was clearly not about anything Pegida people might do. Instead the Pegida people chose not to show up - very sensible considering those out en masse against them. There was no possibility of a peaceful demonstration by Pegida. PS. That was not the end of the matter. The plot thickened a couple of days later, with an email from someone I did not know. Interesting information. . . . Not enough time to report everything!! Freedom of speech means racist.